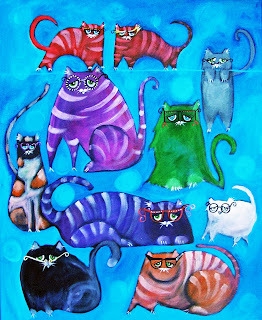 Art by Shelley Szczucki The Charming Place: Who says Cat eye glasses don't look great!!!! Who says Cat eye glasses don't look great!!!! Just to let me comment, thanks to everyone for well wishes on getting my email back to snuff. Apparently someone used my email account to send out a link to some of the people in my address book. Luckily, I was able to sort it out......but since my limit was 300 emails per day, I had to send out a warning through another email account to everyone to explain to them that it wasn't me. What a pain......oh well! C'est la vie! I did get a chance to finish a painting that was commissioned for someone. 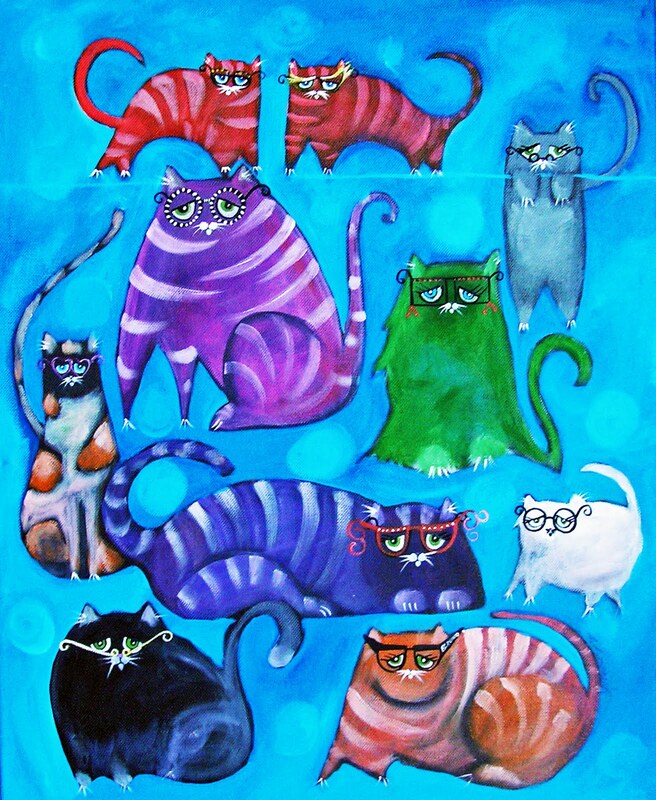 Its a whole slew of colorful cats, all wearing eyeglasses......so colorful! Painting it put a smile on my face right through the email mishap. glad to hear it's all sorted out! took me a while to figure out that 'sa la vi' was "c'est la vie"
Love your cats they are so colourful and cute! Sure do like your kitty cats. They are so full of personality! i Love the kitty glasses!